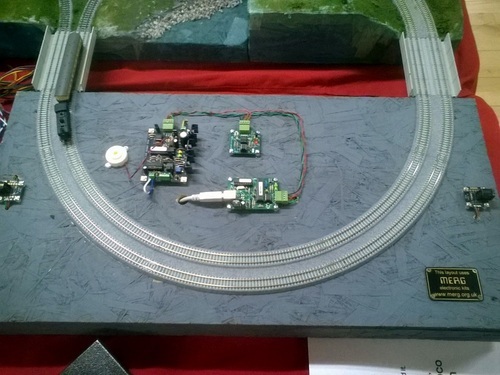 Description: Our Power End Cap has a DCC command station (CANCMD), cab sockets (CANCAB), a USB computer interface (CANUSB4) and CBUS activity indicator (CANACT) built from MERG kits. The circuit boards are on display for all to see and ask questions about. There is space for future expansion, like a DCC booster or Raspberry Pi interface. The command station is not hardwired to the track: there are two RCA jacks on the end of the module connected to power droppers.